'George Thaiias' (Robert Flick, R. 2006) TB, 34" (86 cm), Midseason bloom. 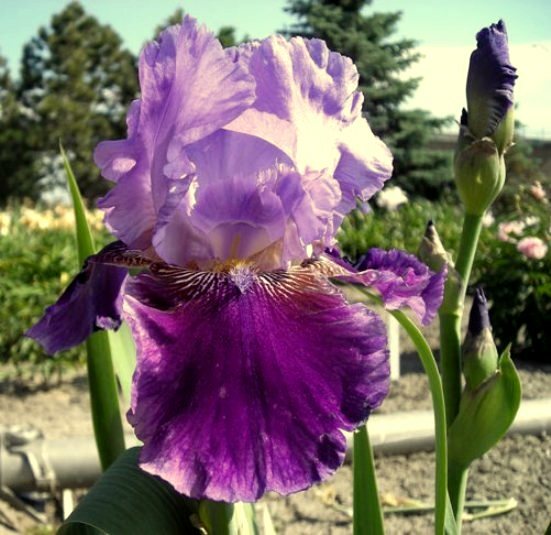 Standards purple (RHS 76C), blended with darker purple (76A); style arms purple (76C); falls red purple (72B), lighter (76C) 1/8" edge, white veining at shoulders; beards red purple; slight sweet fragrance. 'Emperor’s Delight' X 'Armageddon'. Introduced by Blue J Iris, 2008.